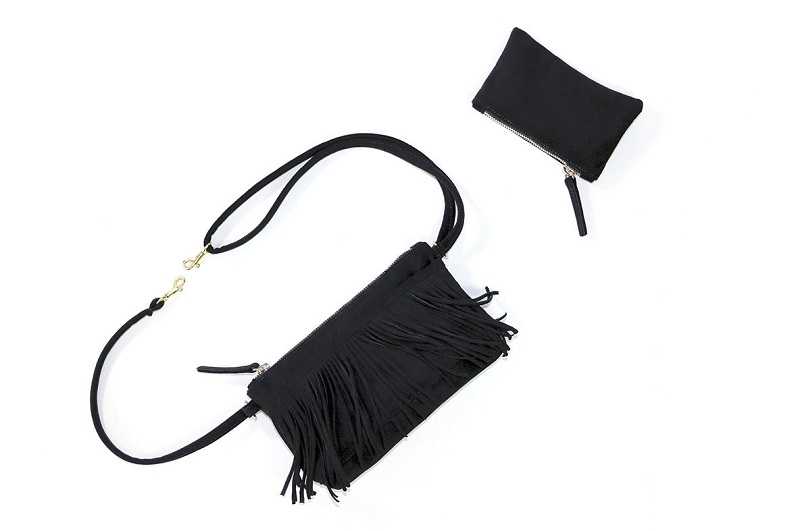 Our roomiest bag yet, our fringe belt bag in soft, durable, Ultrasuede (from post industrial recycled polyester) features glimmering gold accents, convenient zipper top, and an exterior pocket large enough to store your phone, cash, or keys. 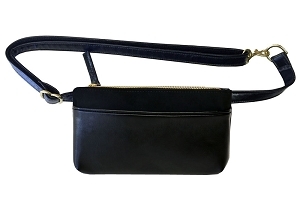 Fully adjustable strap enables the bag to be worn as both a fanny pack and/ or cross body bag. Matching wallet (3 x 5") included. Handcrafted locally and sustainably in Los Angeles. Perfect for my summer in New York! Stylish, perfect size, snd matched every outfit. Fit a charger, my phone, lip stick, with a great little pouch for money and cards as well as a front hidden pocket for easy access to metro card. Way better than my usual tote! 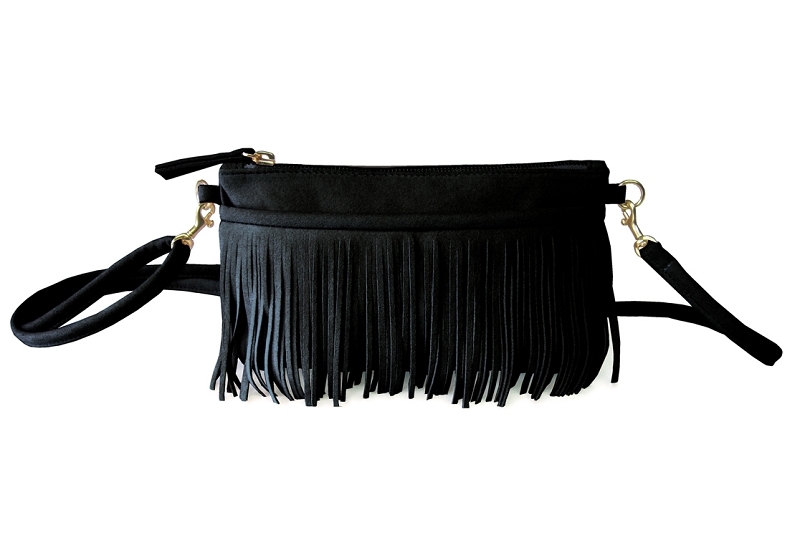 This is my third Hipsters for Sisters bag, needless to say "I absolutely love my new Fringe Belt Bag." It is fun, practical, easy to carry, and it goes perfectly with anything I wear, however the best part is that now I have my hands free. This is one fun little bag. Love this little bag! Big enough to carry all my essentials, but not bulky. Chic, goes with anything, and the suede fabric is gorgeous. Best of all I don't have a pain in my shoulder any more from carrying my handbag! I LOVE this little bag! Very high quality design and detail -- fabric is super-soft and it is a perfectly petite size, that easily carries my iPhone 6 in the outside pocket. Absolutely love this bag! I wore it as a fanny at Coachella (perfect) and again as a crossbody in everyday wear. This purse is great quality, trendy, and so versatile. I love it! 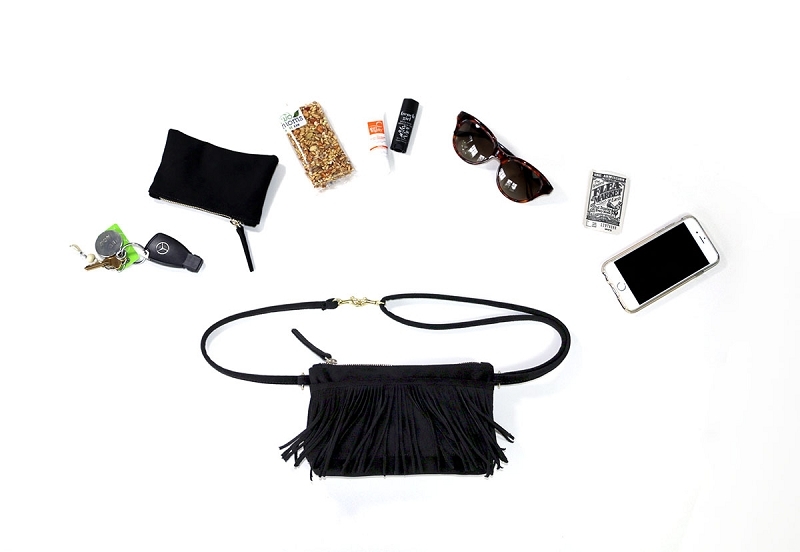 The fringe bag works great as a crossbody, and easily changes to a fanny pack or clutch. I have the Leopard Flat Belt Bag as well and it's great, but I wanted something that was a bit bigger and that zips--the fringe bag hits the mark exactly. It easily holds my phone, sunglasses, small wallet, and keys. Q: Will this bag be available again?